Matt Riddle’s music hit and he came out to the ring, took the mic and said “Bro…” Riddle said that he wasn’t supposed to have a match tonight, but Kassius Ohno interrupted him on the Kickoff show… He said he was supposed to wrestle him next week, but they have two rings right there, then challenged Kassius Ohno to come out so he can knock him out right now. Ohno came out and said, “You’re too stupid to be out here right now. 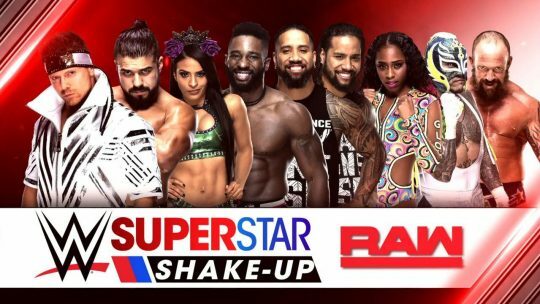 And you’re too stupid to know you’re not ready for TakeOver.” He then told the ref to ring the bell and said he hopes that Riddle enjoys this moment, because he’s not going to remember it, bro. The bell rang and Matt Riddle immediately hit a flying knee to Ohno’s face… 1-2-3 in about seven seconds. Riddle celebrated in the ring as Ohno woozily struggled to get on his feet. About a minute into the match, while the referee was distracted while checking on Baszler, Marina Shafir and Jessamyn Duke ran out and threw Sane into the ring post on the outside. They rolled her into the ring and Baszler locked on a choke hold… and Sane tapped. Baszler controlled the second fall for a few minutes. She tried to vertical suplex Sane on the apron, but Sane reversed it into a crazy DDT on the apron, spiking Baszler’s head. Shafir and Duke tried to interfere again but Sane took them out, then went to the top and hit a flying elbow onto all three women on the outside. Back in the ring, she hit an Insane Elbow off the top for the pinfall. Sane controlled the third fall for a couple of minutes and went to the top again for the elbow, but Shafir and Duke interfered again, with Shafir knocking her off the top while the ref was distracted with Duke. Suddenly, Dakota Kai ran out and attacked Duke and Shafir, but they beat her down. Sane went to the top and went for the top rope elbow, but Baszler caught her arm on the way down and pinned her shoulders down for a surprise pinfall. 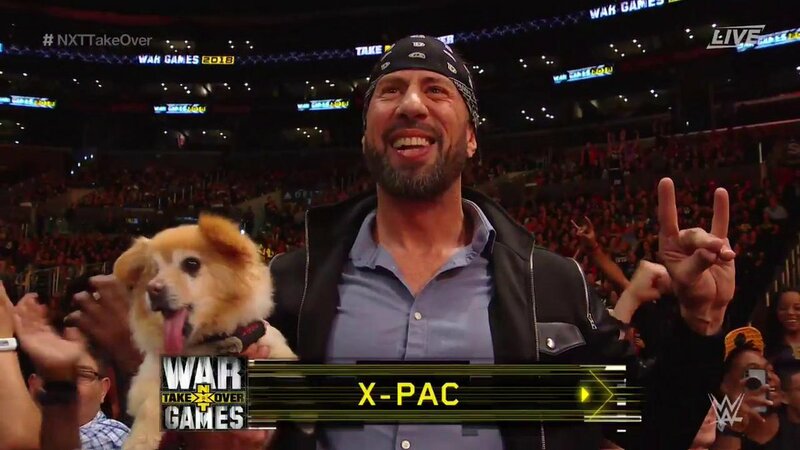 X-Pac was shown at ringside with his dog. They had a stare down to start the match and Gargano slapped him in the face, then Black angrily went at him with a few kicks. After a few minutes of good action, Gargano tried to lock on the Gargano Escape, but Black escaped. Snake eyes by Gargano on Black, face first into the middle turnbuckle. Gargano prepared to hit Black with a running knee. Black crossed his legs and sat in the ring, then told Gargano to give him his best shot. Gargano ran at him with a running knee attempt, but Black moved… but Gargano was able to take control anyway and continued to pound at Black. Gargano went for a suicide dive on the outside, but Black nailed him in the face with a knee. Black set Gargano up for a Black Mass… Gargano looked to be begging Black to “put him out of his misery.” Black went for the Black Mass, but Gargano was playing possum and countered it into a Gargano Escape… but Black escaped. Spinning knee to the face by Black… then another knee, then he hit the Black Mass. Gargano fell into Black’s chest, “out” on his feet… Black looked him in the face and nailed him with another Black Mass. 1-2-3. Dream was dressed as Hollywood Hulk Hogan with an nWo-style “oVa (Dream Over)” shirt. A few minutes in, Ciampa took off Dream’s “Hollywood” head band, then did the Hulk Hogan ear to the crowd taunt. Dream nailed him with a top rope double axe handle, then put his headband back on. He then hit a big boot and did the Hogan taunt, then set Ciampa up for a leg drop, but Ciampa rolled to the outside. A few minutes later, Dream hit the big boot, then three leg drops. 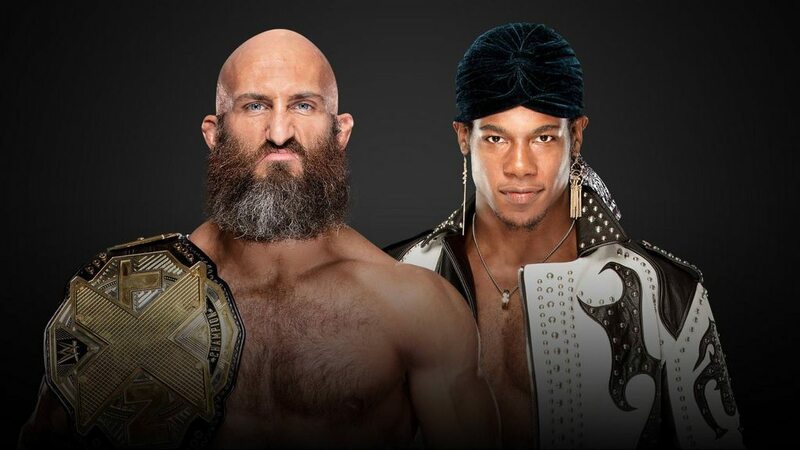 He Hulked up and went for the Dream Valley Driver, but Ciampa escaped. Dream attacked Ciampa’s knee, slamming it on the apron, then he gave him a figure four leg lock with his legs wrapped around the ring post. The referee tried to get Dream to break up the hold and meanwhile, behind the ref’s back, Ciampa tapped. Dream finally broke the hold, then locked it on in the ring. Dream and Ciampa took turns reversing the hold until Ciampa grabbed the ropes to break it up. In a crazy spot, Dream vertical suplexed Ciampa to the outside, but Ciampa held on to Dream and pulled him down with him. Ciampa landed on his legs and appeared to be in pain, then started to loosen his boot. In the ring, Ciampa rolled up Ciampa and grabbed the tights, but the referee saw Ciampa cheating and stopped the count. Ciampa argued with the ref, then Dream nailed him with a Dream Valley Driver… 1-2-no. Dream jumped off the top but Ciampa nailed him… then hit Project Ciampa… but Dream kicked out! Ciampa went outside and grabbed his title belt, then brought it into the ring. The ref grabbed it from him, then Dream nailed Ciampa with a DDT onto the belt. The ref looked shocked, but still counted the pin… but Ciampa kicked out! Ciampa then suddenly hit a DDT on Dream as he was draped over the middle rope… but only got a near fall again. Crazy. A frustrated Ciampa went outside and pulled the padding off the outside, exposing the concrete floor. His boot was taken off completely. Ciampa tried to hit Dream with a draping DDT off the apron onto the concrete floor, but Dream broke free and tackled Ciampa over the announce table. Ciampa started to scream at Mauro Ranallo, but Dream grabbed him and nailed him with a Dream Valley Driver on the outside! He rolled him into the ring and hit the Purple Rainmaker, but Ciampa kicked out! Ciampa rolled to the apron and Dream quickly went for a top rope elbow again, but Ciampa moved and Dream fell to the floor. Ciampa hit Dream with a draping DDT onto the metal area that connected the two WarGames rings… 1-2-3. Excellent match. Adam Cole and Ricochet started the match for their teams, while their team mates were locked in cages next to the entrance ramp. Cole and Ricochet started off a bit slow, with not too much happening during the first five minutes. After five minutes, Kyle O’Reilly was let out of the Undisputed Era’s cage and ran to the ring, where he and Adam Cole beat down on Ricochet. Three minutes passed and Hanson was let out of the cage and ran down to the ring, where he hit a flurry of offense on Cole and O’Reilly. He hit about ten clotheslines in a row on Cole and O’Reilly, putting them in opposite corners then hitting running clotheslines on each one, back and forth. Rowe was in next and again, as the fresh man, was able to showcase his offense on Undisputed Era. He picked up O’Reilly, then Hanson set Strong up on him, and Rowe powerbombed Strong while he was carrying O’Reilly. 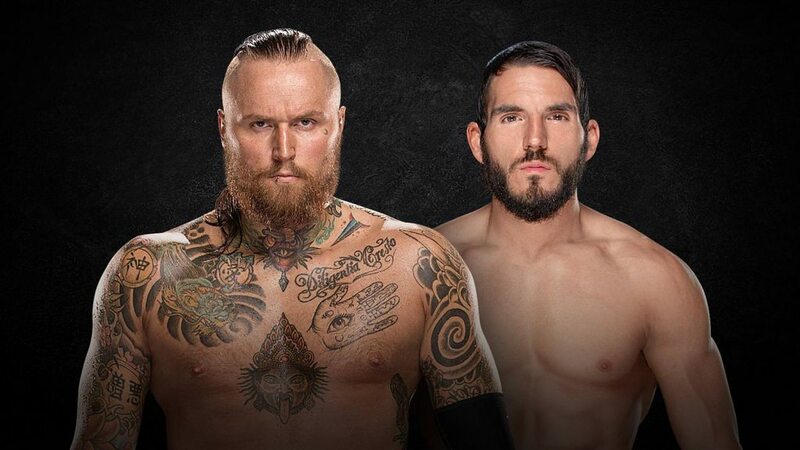 Bobby Fish was next… He went up to Pete Dunne’s cage and nailed Dunne, then took his lock and locked Dunne’s cage… then he threw away the key into the crowd. Fish brought in a few chairs and the four members of Undisputed Era nailed their opponents with them. Three minutes passed and it was Dunne’s turn to enter, but he wasn’t able to escape his cage, since Bobby Fish locked him in. Undisputed Era kept the 4-3 advantage in the ring, hitting top rope suplexes on both War Raiders. The refs came in from the back with bolt cutters and finally broke Pete Dunne from his cage. 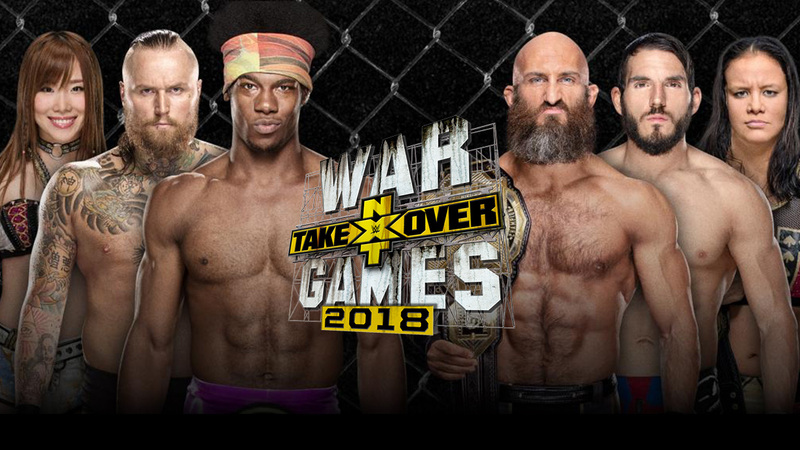 Undisputed Era tried to keep him from entering the WarGames cage, but Dunne grabbed a kendo stick and nailed them, then Ricochet hit a top rope cross body block on all four members. Dunne threw in two trash cans and a table into the cage… and another table. Dunne finally entered the cage and the WarGames match “officially” started, with all competitors in the cage. The faces beat down on Undisputed Era with all of the weapons, but Undisputed Era eventually regained control, taking out everyone but Pete Dunne. They surrounded Dunne, but Dunne was able to fight all four men off. Dunne locked on a submission hold on Fish, but O’Reilly broke it up. O’Reilly wrapped a chain around Dunne’s previously injured leg and locked on a submission. The War Raiders, in the other ring, tried to help, but Undisputed Era fought them off with chairs, preventing them from entering the other ring. Finally, Ricochet jumped over the ropes and took out Undisputed Era, then broke up the submission on Dunne. Adam Cole climbed to the top of the cage and Ricochet followed him and the two fought while sitting on the top. Dunne grabbed Cole and tried to suplex him off the top rope, but then like every other member of the match but Ricochet joined in and they all held onto each other and everyone crazily fell to the ring as Dunne suplexed Cole (tower of doom, sort of). Undisputed Era stood in one ring and their opponents stood in the other and the two teams faced off with each other, with only the ropes separating them… Then they all attacked each other. Springboard by Ricochet but Pete Dunne nailed him with a superkick. Cole then hit Dunne with “The Last Shot” but Dunne kicked out… He tried again but Dunne moved, then hit the Bitter End on Cole. Ricochet then hit a top rope 450 splash on Dunne… Dunne and Ricochet both pinned Cole… 1-2-3. Amazing match, which very much lived up to expectations. Ricochet and Dunne faced off with each other after the match, but then seemed to show respect to each other. After replays, Dunne and Ricochet stood atop the WarGames cage next to each other, each holding their titles, celebrating their victory.